It’s hard to tell that the clock is winding down for Pierluigi Oliverio, the San Jose councilman who is being termed out after a decade representing Willow Glen and the Rose Garden. 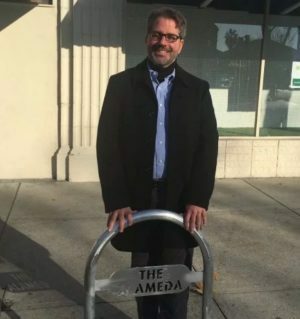 San Jose Councilman Pierluigi Oliverio, next to one of the bike racks he had installed on the Alameda. The 47-year-old politician, who will turn over his office to Dev Davis at the start of the New Year, is still collecting constituent inquiries for what might be the council’s most extensive database — nearly 17,000 entries that encompass everything from squirrels to park sprinklers to Christmas decorations. As part of his closing act, he is delivering his own form of bacon to the masses: 100 new bike racks on the Alameda and Lincoln Avenue, nicely identified with the name of the street. In a slow-moving city government shaped by unions, Oliverio is the most obvious outlier, using half his $750,000 office budget for projects like artwork and street furniture in his district. He ran his office like a small duchy in the vast and bumbling Austro-Hungarian Empire. The councilman has never been a coalition builder, a man who might trade votes or speak encouragingly about a project he didn’t really like. He was the lone council member to sign the argument against Measure F, the peace treaty with unions over pensions. His outspokenness occasionally irritates his colleagues. At the final council meeting of the year, Mayor Sam Liccardo needled Oliverio, a former bartender, for wearing a dark tux. For all that, Oliverio has been a one-man tornado in constituent service, an extraordinary retail politician. Is there a problem with speeding complaints? Oliverio will buy a radar gun with his office budget to measure actual speeds. Did a well-known homeless man leave a concrete bench at the Alameda and Singletary Avenue befouled? Oliverio will appropriate money to get it professionally cleaned. Is the city estimating that it will take $28,000 to maintain the Municipal Rose Garden’s fountain for a year? Oliverio will find a private company to do it for $7,000. None of this means he is without critics. Steve Kline, who ran against Oliverio in 2012, says Oliverio has been slower than his colleagues in informing neighborhood associations of new projects, like the Hustler Hollywood store in the Burbank area. Oliverio was at the center of a series of quirky battles, particularly with unions: Even earlier than Mayor Chuck Reed, he saw the need for pension reform, with his Measure W allowing lower benefits for new hires. In 2010, he was cornered by angry firefighters for taking down “No on V” signs from public medians. (“V” would have weakened the power of arbitrators in settling disputes with employees.) The moment embarrassed Oliverio politically, though he still defends the right to take down signs that he says amount to litter. A gregarious man who will return to work full-time for his software company (SupplyFrame), Oliverio was nonetheless known for showing up at bar mitzvahs, neighborhood gatherings and birthdays. The outgoing councilman, who is sometimes spoken of as a potential candidate for supervisor in 2018, says he is still pondering the email from a constituent who complained about the holiday drivers pausing to stare at decorations in the area bordered by Willow Street, Carolyn Avenue and Glen Eyrie Avenue. After all, the whole point of the holiday displays is to attract visitors. And whatever his instinct for fiscal restraint, Oliverio remains enough of a politician to avoid being a grinch at Christmas. Contact Scott Herhold at 408-275-0917 or sherhold@mercurynews.com.